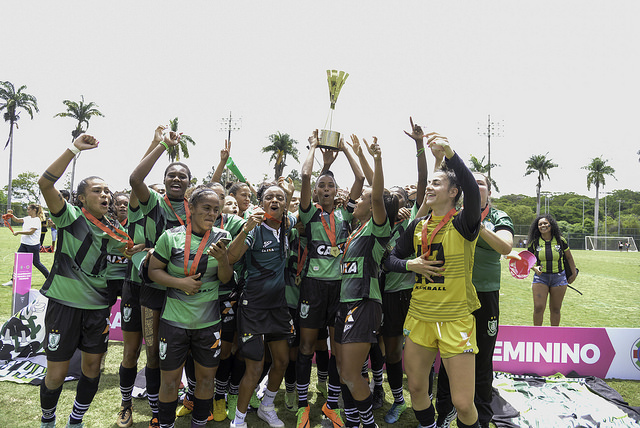 America won their third Campeonato Mineiro Feminino in a row after having beaten Ipatinga in a thrilling two-legs final which ended up on an incredible penalty shoot out session. Check out what happened. During regular time at Campo Sesc Venda Nova, Belo Horizonte, both teams had their chance to score but could not hit the target. Early in the match (7’), Vanessa hit a fabulous shot for America, but the dive of Karol was not less superb. In return, Ipatinga found the wood following quite a messy free-kick and America was lucky enough to be able to clear the mess (22’). Both teams had more chances, thanks to Ronaldinha (43’) and Thay (90’) for Ipatinga and Vanessa (78’, 80’) for America, but the ball did not want to go in. So it was time for a penalty shoot out. And it’s been an incredible one. Eighteen penalties were taken, 15 of which were scored. Karol saved the first shot for Ipqtinga but was then very unlucky on the third one, deflecting the ball on her post, which then roll on the line, hit the other post and got in… The chance for Ipatinga had passed. After a long suspense with everybody pretty much scoring, Ipatinga cracked down on the 17th penalty, which Camila stopped with a lot of authority. It was then "just" a matter for America to score the last one, which Carol Dias did without shaking. It was pure joy on the pitch between the girls of America, who won the trophy for the third time in a row, a fantastic achievement. "It was a very big responsibility", said Carol Dias after the game. "It was the last penalty because they missed, and it was me to score it. I was a bit anxious, but then I was very happy to have converted it. To be champion is an incredible sensation." For Ipatinga, the disappointment is necessarily high, as they would have won their second title after the trophy won in 2015, but already before the game, their coach Kethleen Azevedo had praised her players : "These girls are more than champions. We know the difficulty of playing football for women, especially in the interior. They do not live in football, they need to work, study and still manage to train seriously, it is not easy. It is only possible because they love what they do, I can see in their eyes how much they want this title."